The teen who was run over by a Broward County bus earlier this month is no longer in a medically induced coma but still hasn't regained consciousness, attorneys for his family said Wednesday. Jerry Cunningham, 14, suffered a traumatic brain injury and remains in stable condition following the May 10 incident in Pompano Beach, according to a statement from the Anidjar & Levine law office. It's too early to determine when or if Cunningham will regain consciousness or the extent of his injuries, but it's hopeful that he'll be transferred out of pediatric ICU shortly, the statement read. Cunningham had been running to catch the bus in the 1200 block of E. Sample Road when he jumped on its exterior, the Broward Sheriff's Office said. At least one witness said Cunningham had been stuck with part of his arm caught in the door before he fell and was run over. Cunningham suffered fractures to his face, ribs and ankle in the incident, which was caught on surveillance footage from inside the bus. A 14-year-old boy who jumped onto the outside of a Broward County bus was hospitalized after he was run over by the bus in Pompano Beach Friday morning, officials said. Bus rider Brian Clark and Broward Sheriff's Office spokeswoman Dani Moschella spoke about the incident. The driver of the bus, Reinaldo Soto, 55, is on administrative leave pending the outcome of the investigation. 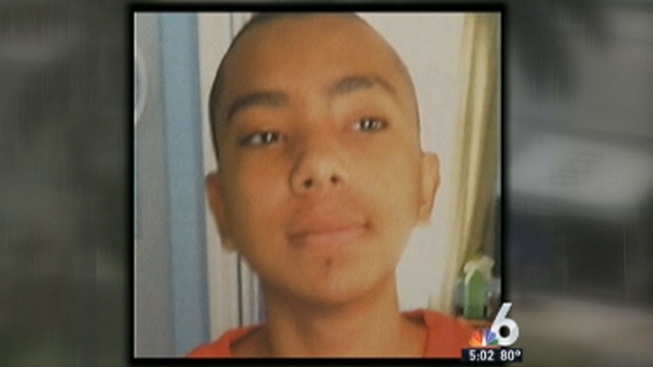 On Friday, Cunningham's classmates at Crystal Lake Middle School will be holding a walk to raise money for the family. The walk will take place at the school beginning at 10 a.m.
A "Jerry Cunningham Fund" has also been established to help pay for the teen's medical expenses. Donations can be made payable to the Jerry Cunningham Fund at Wells Fargo Bank at 1710 S. Andrews Avenue, Fort Lauderdale, FL 33316.